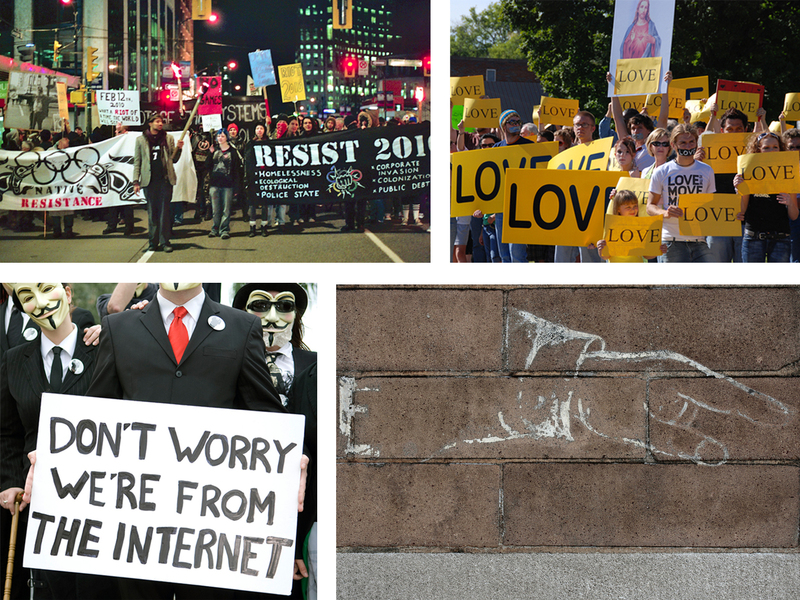 Social networks are great for raising awareness about social and political causes. Since joining Fbook almost 4 months ago, I feel more knowledgeable about global and environmental concerns that may not have caught my attention (or, at least, as much of my attention) as before. This is due to certain Friends involvement with these particular causes…Friends who might be interested in the same issues as myself and/or Friends who have very different interests from my own. Some critics argue that this kind of online dialogue does nothing to actually help solve problems, yet others argue that it can lead to change…especially when directed towards organizations that are responsible for making important decisions. Perhaps my teacher and researcher selves take over in these moments of open dialogue…sharing resources, providing links for further information, communicating the importance of attending to these issues, instigating debate to probe the ideas raised…not looking for agreement at all, just looking for some insightful chit chat. But I’m afraid that external selves who might not perceive this window of opportunity on Facebook will instead perceive me as a NAG. I don’t mean to disrupt the escapist FB posting flow – mindless sharing of retro music videos, funny pictures of cats, cute close-ups of babies, unbelievable moments of self-exposure on youtube – no, don’t get me wrong….I succumb to these pastimes just as much as everyone else. I guess that’s why I try to downplay my posts that relate to social and political issues, so it doesn’t sound like I’m lecturing….”I’m not a political activist but…” (aka – it’s ultimately up to you whether you read this or not but it is something you should know about….). :: Inspired by Calvin’s Schrag’s book The Self After Postmodernity, I am in pursuit of a philosophy of The Self After Facebook. For the autobiographical tone of this pursuit, I am indebted to Tom Sherman‘s Before and After the I-Bomb: An Artist in the Information Environment. 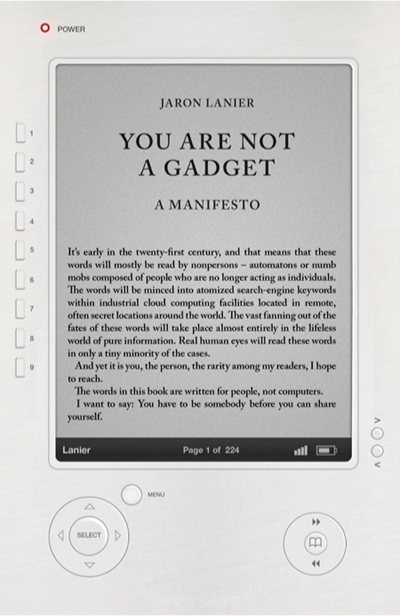 I recently found out about another book that might be to my liking called, You Are Not a Gadget, by Jaron Lanier. I LOVE the UK edition front cover (see above). I’d like a poster of it for my office wall. :: I’ve been thinking more about the social and interactive aspect of networks the past couple of days. Hannah Arendt (1958) wrote that “the subject appears and exists only in relation to others,” specifically through our actions and words – who you are is disclosed through your words and deeds. To examine the networked self, we need to not forget about the social behaviors of others, and of the network at large. To understand the post-Facebook “self” we need to understand the “social” in social media. The postself exists not merely through self-interpretation but through relations with others on/with/in the web. The internet has been described as a place where people engage in identity work, and an important arena for inquiry into the production of postmodern selves (Broad & Joos, 2004). The internet has evolved into a place/space for human interaction with social media. What is “social” about social media? (see Ron Burnett’s blog in the previous link for a good overview) What makes it more than a collection of individual actions?